Otto Drögsler’s works are often centred on silhouettes and figures. He is particularly drawn not only to faces, but also to caricatures. For Drögsler, it’s about capturing a momentary facial expression, or about creating an artistic reflection of a person whom he perhaps noticed in a crowd or passed by on the street. With quick, generous strokes, Drögsler brings out the unique characteristics of his subjects’ faces. 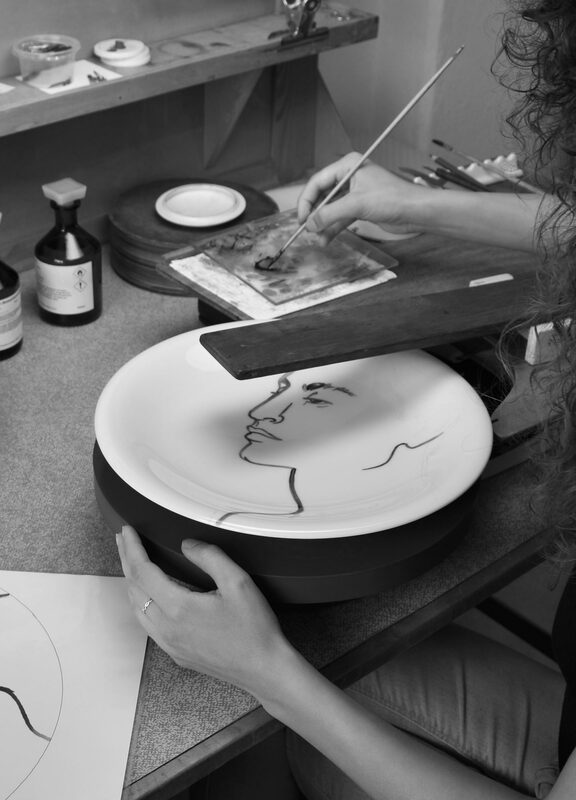 Originally full-scale ink drawings on paper, the illustrations for “Faces” were then applied to the wall plates by hand using blue porcelain paint, bringing Otto Drögsler’s drawing and painting style to the traditional realm of wall plates in a fresh and modern way.